John Speed’s c.1610 map showed the area as King’s Hill. Over 100 years later, John Rocque’s 1746 map [An Exact Survey of the Citys of London, Westminster, ye Borough of Southwark, and the Country near Ten Miles round] shows the area as Island Green and Dulwich Hill. 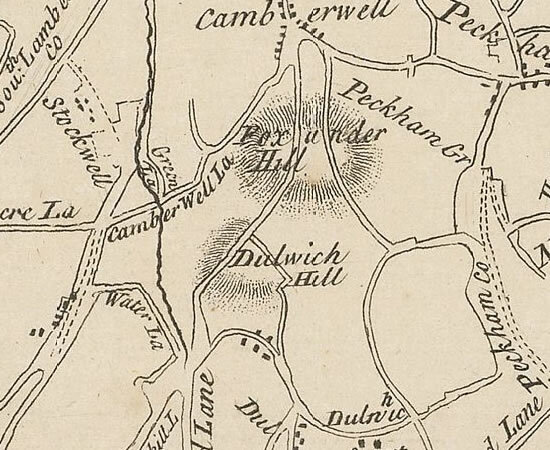 And Bennost’s 1758 map (above) shows the area as ‘Dulwich Hill’. It may be that the river Effra - now sadly almost all underground - attracted large numbers of herons, so that a hillock by the river came to be known as Heron Hill. Another interpretation of the name is ‘hill by a nook of land’ deriving from the Old English hyrne (corner, angle) hyll. The first documented reference to Herne Hill seems to be as late as 1801.